A retrospective of the last twenty years of the artist’s work, from the New York downtown vibe to the pastoral landscapes, from the characters populating her style of “urban realism” to the softer seasonally-inspired landscapes featuring natural elements such as water, air and light. All paintings are oil on linen or canvas. SHERRI PAUL, an award-winning local artist, works out of the Green Studio on Fulton Street in Lower Manhattan. At Penn State, Sherri studied under acclaimed graphic artist Harold Altman, and then went on to receive an advanced degree at Lehman College. In her New York series of paintings, Sherri explores the city and its bewildering world of unlimited possibilities in a style she calls “urban realism.” These cityscapes and portraits capture the color, light and moods of the City and the variety of its inhabitants. 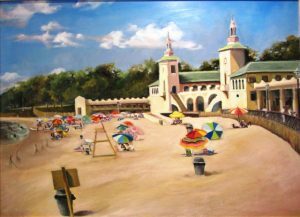 The paintings, all in oil on linen or canvas, record fleeting moments in time with a snapshot quality and a quirky humor. In a review in Gallery & Studio, Maureen Flynn wrote that Sherri Paul’s paintings “resonate poignantly in compositions as notable for their abstract virtues as their skilled realism.” A series of New York-inspired paintings is called “Sweet Treats” and features New York-style mouth-watering desserts. In a recent series, Sherri has produced seasonally-inspired landscapes featuring natural elements such as water, air and light. Sherri’s paintings are in numerous private collections.